are for the Mumbai, Tarapur, Visakhapatnam, Kolkata locations. Degree qualified candidates can apply online for this BARC UDC Posts. For Stenographer posts 10th class qualification with Stenography knowledge. Last date to apply online for this BARC UDC recruitment is 25-02-2019. Official website to apply online is https://recruit.barc.gov.in. Candidates selection is on basis of written exam (Two Levels) for this BARC UDC Posts. 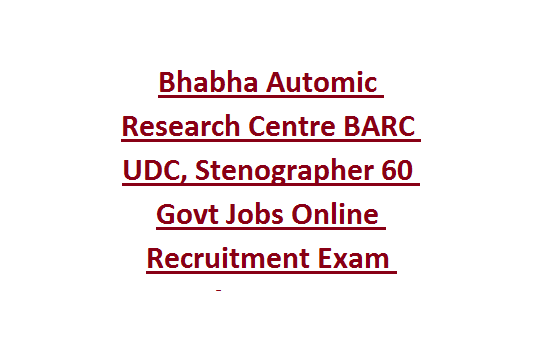 For BARC Stenographer posts Written exam and Stenography test will be conducted. Exam Pattern and Syllabus, age limits, qualification, salary, and other details are updated below. Gen-27 years, For SC/ST-32 years and for OBC 30 years. For Stenographer-10th class pass and English Stenography knowledge with 80 wpm and typing speed of 30 wpm in English. For both the posts a written exam will be conducted in Level 1. In Level 2 Stenography Skill test will be conducted for Stenographer posts. For UDC Posts-In level 2 descriptive test will be conducted in English Language and Comprehension. Level 1 Written exam syllabus topics are given below. 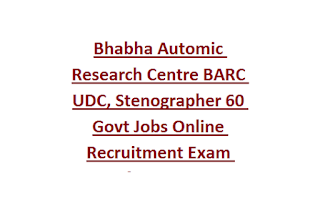 Apply online before the closing date of 25-02-2019 for this BARC Upper Division Clerk and Stenographer Grade 3 posts. Official website to apply online is https://recruit.barc.gov.in.